Meet Ken and his new fuzzy friend! It gives us great pleasure to introduce you guys to our new friend, Ken. 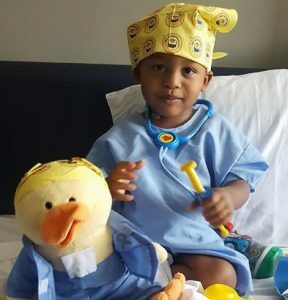 He is an adorable 2-year-old boy who was recently diagnosed with ALL. Be sure to give Ken a big, warm, virtual hug through our Facebook! This entry was posted in Stories and tagged ALL, Chemo Duck, Chemo Duck passport, chemoduck. Bookmark the permalink.